UNITED NATIONS, October 21 -- On Darfur, first the UN stopped producing its Humanitarian Report, then it stopped producing any Global Malnutrition Data. In August 2010, Inner City Press asked why and was told the data would be available “in one or two days.” It wasn't. In mid September, new Under Secretary General for Humanitarian Affairs Valerie Amos told Inner City Press that the delay was due to attempts to do “joint assessments” with the Sudanese government, whose President Omar al Bashir has been indicted by the International Criminal Court for war crimes and genocide. 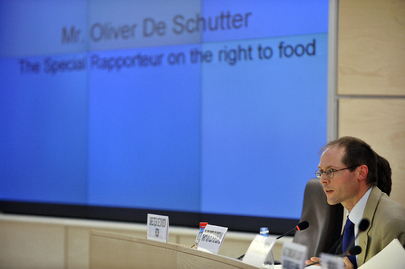 On October 21, with data still not released and the UN - African Union Mission in Darfur now refusing to answer questions from Inner City Press about the data and other collaboration with the al Bashir government, Inner City Press asked the UN's Special Rapporteur on the Right to Food Olivier de Schutter about both the blocking of release of malnutrition data, and Sudan's blockade of food from internally displaced persons camps like that in Kalma. Video here, from Minute 32:02. Olivier de Schutter told Inner City Press that he will investigate the complaints if provided with sufficient prima facie evidence. Video here, from Minute 37. This has now been done. “concern that the Sudanese government 'very often' bars the release of data on child malnutrition in Darfur. Nils Kastberg, UNICEF Representative in Sudan, said that the Sudanese security services have also hindered or delayed UNICEF’s access to camps in Darfur. This has now been submitted to Special Rapporteur de Schutter by Inner City Press. Watch this site.